The Association of Knights Templar of Scotland and Wales does not have a Grand Master. 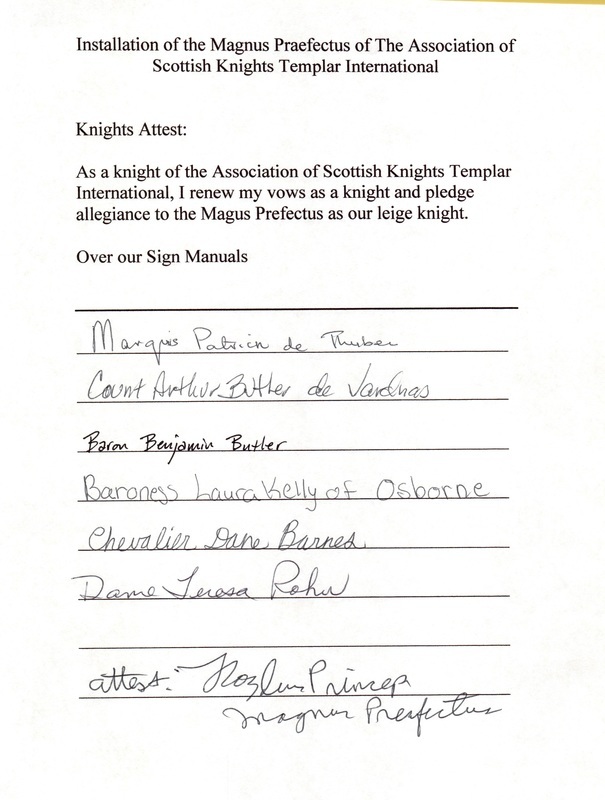 Instead, it has a "Grand Prefect," the Magnus Praefectus who is duly elected by all Templars of the Association. The formation of the Association has an interesting history. In the 18th, 19th, and 20th centuries, several small groups of Templars existed in Scotland, all claiming a history of existing from the time of the Templar battles in Scotland. In the mid-20th century, several of these groups were persuaded to enter into a larger Templar Order. However, organizational problems concerning the election of a Grand Master developed in that larger Order, and the smaller groups decided to withdraw and reclaim their prior independent status. Once out of the larger Order, the groups met in Rosslyn Chapel and formed, for mutual support, The Association of Knights Templar of Scotland and Wales. While he was playing the Rosslyn Chapel organ for the event, Dr. Challenger was nominated and elected as the first Magnus Praefectus. H.E. Dr. William Challenger, the Marquis de Challenge, was a musician by profession and a Master Organist, a designation which gave him access to major organs throughout the world. His organ recitals were known for masterful performances of baroque and classical music, as well as modern show tunes and modern music! Dr. Challenger rarely used sheet music during his performances, since he had committed the music to memory. ​The Marquis de Challenge was unanimously elected as the first Magnus Praeceptor, in which office he served until his death on September 20, 2012. One of his major accomplishments was the founding of the thriving Grand Priory of Colorado, U.S.A. The death of the First Magnus Praeceptor and of the Scots Praecptor left the Association without leadership, except that the Marquis de Challenge had left a strong and thriving Grand Priory in the United States, in the State of Colorado, under the Grand Prior Prince Lloyd. Upon the Grand Praeceptor's death, a search began for remaining Scottish Knights of the Association in both Wales and Scotland, in order to determine who wished to be nominated to the office of Magnus Praefectus. This well-documented search, which included both internet searches and actual in-person searches in Wales, turned up no other Templars of the Association, the most common designations being "moved; no forwarding address" and "deceased." 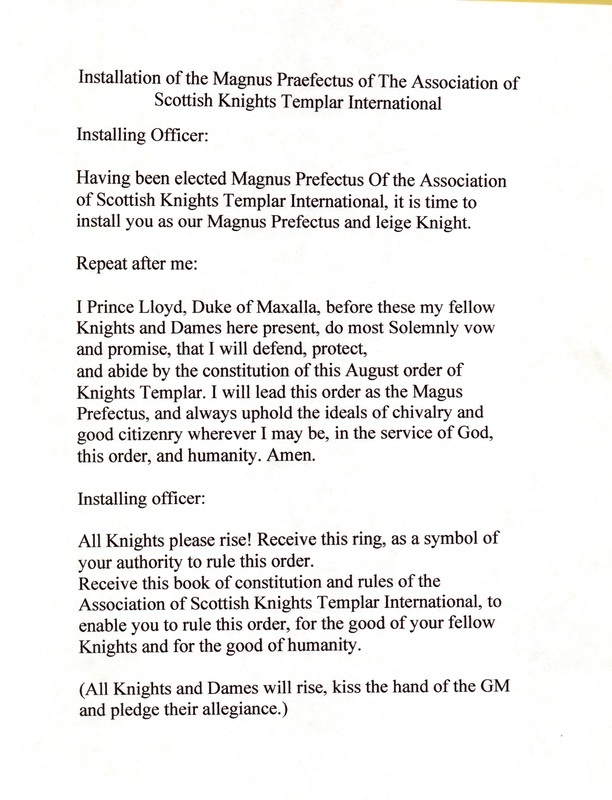 Finally, after a four-year search, the remaining Templars, seeing a need for continued leadership for the strength of the Association, nominated and unanimously elected (following Templar practice) the Grand Prior of the Grand Priory of Colorado, U.S.A., His Serene Highness Prince Lloyd, the Duke of Maxalla, to the Office of Magnus Praefectus. The election and installation occured on Saturday, June 11, 2016. Below: ​ the Installation Ceremony of the Magnus Praefectus. The Second Magnus Praefectus explains how the Grand Cross and Ring of the First Magnus Praefectus came into his possession.